Linkedin is one of the largest professional networks around, and with a growing user base of businesses and individuals around the world, there is plenty to get excited about. Whether you are new to the platform or simply looking for some tips and tricks to help make sure you are getting the most of it, we are here to help. On Facebook, pages and people are distinctly separate – and business pages don’t directly rely on a company’s employees or business partners. At least not to the degree that they do on LinkedIn. Some of the strongest LinkedIn pages I have seen are ones where the entire workforce act as ambassadors for the business; promoting their own work, alongside information that interests them from within the business itself. On LinkedIn, there really is much more power given to individual profiles when compared with business profiles – and this is something owners of those pages should take note of. Following on from the previous point, if you want to create a culture where your employees share updates on their page and help to advocate your business for you, the best way is to educate and motivate them. Keeping your staff trained on how to use their own LinkedIn is a mutually beneficial practice. It helps them to improve their own public profile, whilst providing them with tools to share your business news and updates with a wider audience. Our advice is to host a training course to teach staff about the platform; one that hopefully energises and motivates them to use it, whilst making sure that this it is not a job requirement. This is a fairly self-explanatory one, so we won’t spend much time on it. If you want to be bigger on LinkedIn, make sure you put in the leg work and post regularly. The recommended amount to post isn’t set in stone, but we would recommend at least 3 posts per week – with more time spent engaging/sharing commenting on other user’s and businesses’ posts. An area where LinkedIn stands out is being one of the best platforms for thought leadership. At the end of the day, people buy people, and LinkedIn is all about providing a place where people can sell themselves (Not like that. Don’t make it weird). The best ways of raising your profile as a thought leader on the platform is to create engaging content that shows your knowledge and experience. LinkedIn articles, infographics, photos from interesting locations and interviews or collaborative pieces with other influential people are just a few of the routes you could follow to build authority. Disclaimer: being a thought leader doesn’t mean being a know it all or a show off. No one likes a show-off, Karen. Honest talk now. LinkedIn ad manager used to be an absolute pile of crap. Thankfully, after several updates, including a few in the last couple of months, LinkedIn advertising has become a much more user-friendly endeavour. If you haven’t used ads on the profile before, there hasn’t been a better time. With the most comprehensive business professional targeting available, it should be an absolute go-to when you want to target people in certain roles/industries/company sizes etc. If you already have a pretty comprehensive Facebook and Twitter business profile and want to include LinkedIn, please don’t just roll the same strategy out. LinkedIn is a beast unto itself and treating it the same as Facebook will be to your (and your followers) detriment. There may be fewer canapes on LinkedIn, but the fundamentals are the same. Keep it authentic, focus on the people and achievements of your business, and make an effort to get to know the people around you. This part of LinkedIn has commonly been abused by people’s self-interests, but there are good LinkedIn groups out there! The best thing about groups on LinkedIn is that there is usually a huge variety for almost every industry. Try joining one with a relatively small but active audience, and actually engage with the people in it. Rather than being the person at a networking event that gives business cards to people without even saying hello, try to be the person who gets to know the others in the room and actually forms a meaningful connection. Extra hint: Another plus of joining a group is that it allows you to add people to your network who aren’t 2nd or 3rd connections. You’re welcome. Besides the typical free LinkedIn account, there are a number of paid options available. LinkedIn premium works the same as the free version but gives you more visibility and information. Instead of capping the number of people who visited your page, you can get much more insight into who is viewing your profile and what they searched for. You also get access to InMails which are a nifty emailing tool which lets you message people outside of your network. You only get a few of these per month depending on your profile level so make sure you use these wisely and not just to tell Borris Johnson he is a wanker. The other main account type for LinkedIn is Sales Navigator. This is a tool which sits almost separately to LinkedIn, and gives you a variety of options which make it easier to find and capture new leads. You can save and track people as leads, access comprehensive searching options to find new contacts, and you also get more InMails. It can be a little pricey, and there are options to add more people and create a business team account, but it’s certainly something to look at if you are serious about creating leads on LinkedIn. 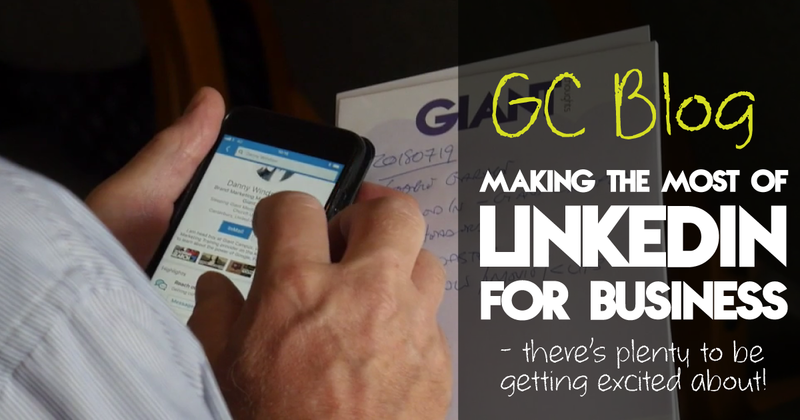 Whetted your appetite and want to know more about LinkedIn? Giant Campus offers a comprehensive course to selling yourself on LinkedIn, which you can check out here. In the meantime, join our network on LinkedIn and let us know any tips we missed!